Italian director Federico Fellini’s 1954 film La Strada won the Oscar for Best Foreign Language Film and established Fellini as one of the top directors of his era. Sixty years later the film and Fellini’s private life still have a strong attraction to a lot of people, including Jeff Mills who conceived, wrote and directed La La La Strada at this year’s Hollywood Fringe Festival. The show was the most theatrical of the twenty plus shows I saw during the Festival. It was totally captivating and a feast for the eyes and ears. You didn’t have to know all the details of the film or of Fellini’s life; the story telling elements gave you all you needed to become deeply involved in the work. 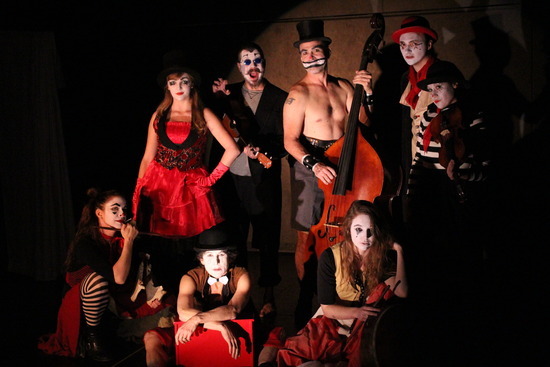 A very talented troupe of seven performers, in white clown faced makeup, took on a variety of roles as well as playing instruments and manipulating a puppet that stood in for Fellini. They blended together seamlessly as they slowly re-enacted scenes from the film and even more slowly peeled back the layers of Fellini’s life and relationships. Blythe Foster was truly Chaplin-esque, showing every emotion effortlessly on her face and in her posture, in the role of wife/muse/film star Giulietta Masina. Jeff Mills mainly played the role of film star Anthony Quinn who starred in the film as the sadistic strong man Zampano. Jim Connolly composed and performed his original music which added immensely to the mood of the piece as did Erin Davison’s lights and Dana Fox Ortner’s costumes. Hopefully you will get another chance to see La La La Strada by the proboscis theatre.